The stage of Stansbury Theatre will be transformed into Formoutiers, France, circa 1200, for Lawrence University opera studies’ production of Gioachino Rossini’s “Le comte Ory” (“Count Ory”). 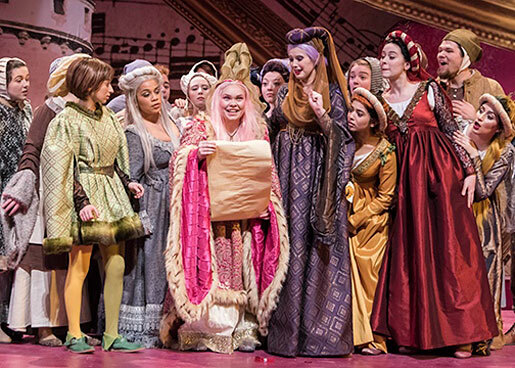 Four performances of the French comedic opera will be staged March 1-3 at 7:30 p.m. with a matinee show March 4 at 3 p.m. Tickets, at $15 for adults, $8 for students/seniors, are available through the Lawrence Box Office, 920-832-6749. The production will be performed in English. Countess Formoutiers (Anna Mosoriak ’19) reads a letter informing her the town’s men are returning from fighting the Fourth Crusade as Isolier (left, Emily Austin ’20), Alice (Annie Mercado ’18) and Ragonde (Lorna Stephens ’18) look on. Photo by Ken Cobb. For his first and only French comedy, Rossini borrowed liberally from the popular vaudeville and burlesque shows that used satire to expose the corruption and the dying strains of the noble class and church-ordained rule. Religious piety and taboo, along with a dose of gender-bending and cross-dressing, lead to situations worthy of the opera’s roots in burlesque and farce. Written in 1828, the plot follows the attempts of the notorious gadabout Count Ory to seduce the Countess Formoutiers, whose brother has joined the town’s other able-bodied men to go off and fight in the Fourth Crusade, leaving her in charge. The countess creates a safe haven for the noble war widows inside the castle, barring all men from entering its walls. Outside the castle, and hiding behind the power of the church, Count Ory disguises himself first as a hermit and later as a nun in his seduction efforts. But the disguises are thin and he is unmasked before he is able to complete his conquest. Luke Honeck ’19 portrays Count Ory (left) while Erik Nordstrom ’19 (center) plays his friend, Raimbaud, and Alex Quackenbush ’19 (right) sings the role of the Tutor. Photo by Ken Cobb. “The dissolution of the nobility was in flux in post-Revolutionary France, as well as in the rest of Europe, including Rossini’s native Italy,” said Woodruff. “Monarchs in Spain, Italy and France were half-heartedly supporting constitutional monarchies with varying percentages of power shared with appointed and elected parliamentary houses. 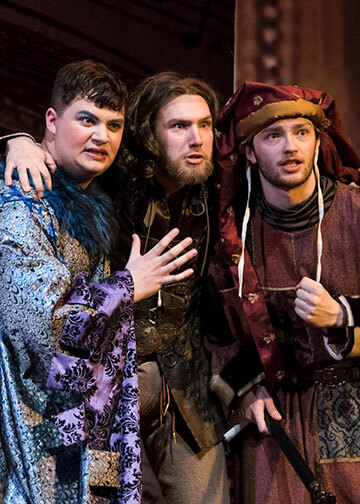 In the double-cast production, which runs 135 minutes with one 15-minute intermission, junior Luke Honeck, Achorage, Alaska, shares the role of Count Ory with Benjamin Boskoff, a graduate of the University of Michigan School of Music. Senior Clio Briggs, Moretown, Vt., and junior Anna Mosoriak, Highland, Ind., each sing the role of Countess Formoutiers. The role of Isolier, Ory’s page, is sung by sophomore Emily Austin, Washington, D.C., and senior Martha Hellermann, Shorewood. Juniors Nathan Brase, Salem, Ore., and Alex Quackenbush, Sun Prairie, share the role of the Tutor. Sophomore Nick Fahrenkrug, Davenport, Iowa, and junior Erik Nordstrom, St. Paul, Minn., sing the role of Raimbaud, Ory’s friend. Ragonde, a companion to Countess Adele, is sung by senior Lorna Stephens, Blue Hill, Maine, and junior Clover Austin-Muehleck, San Francisco, Calif. Senior Annie Mercado, Des Plaines, Ill., and senior Charlotte Noble, Traverse City, Mich., share the role of the peasant girl Alice.